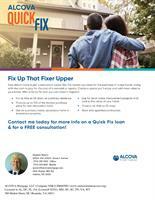 Alcova's Quick Fix | New carpet, kitchen/appliances, redo bath, add or enlarge outdoor living areas - the potential is unlimited. Your Dream Home is Just a Renovation Away! second mortgage or use high-interest financing to accomplish your vision!